LeDuc & Dexter installed the piping, hose stations, drains and process waste system for the crush pad, which is permanently situated behind the building. They’ve made provisions for the forthcoming boiler and the air compressor, along with pressure boosting the water system. LeDuc & Dexter has also installed all of the copper piping for hot and cold water lines and compressed air. “LeDuc & Dexter have been on schedule or ahead”, reports Cleland. 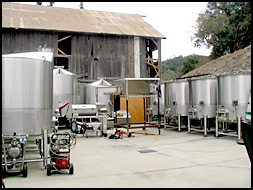 Speaking of schedules, the crush isn’t over for Brown Estate Winery. Next up, last but not least, Zinfandel.